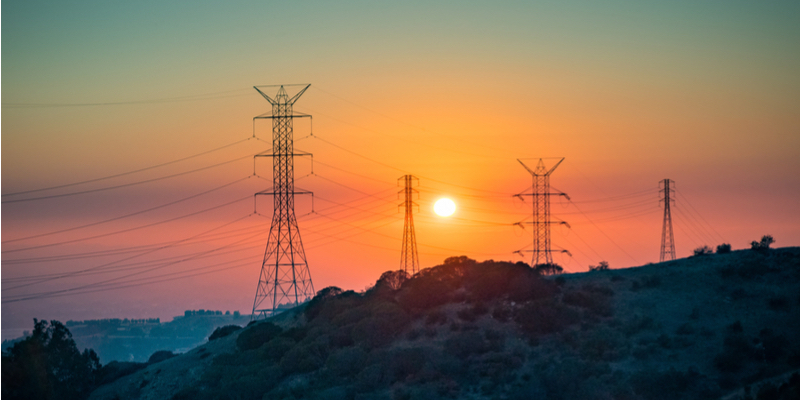 Home > Electrical Services > Where Does Los Angeles Get Its Electricity? Have you ever wondered where your home’s electricity comes from? It’s a bigger question than you might realize! 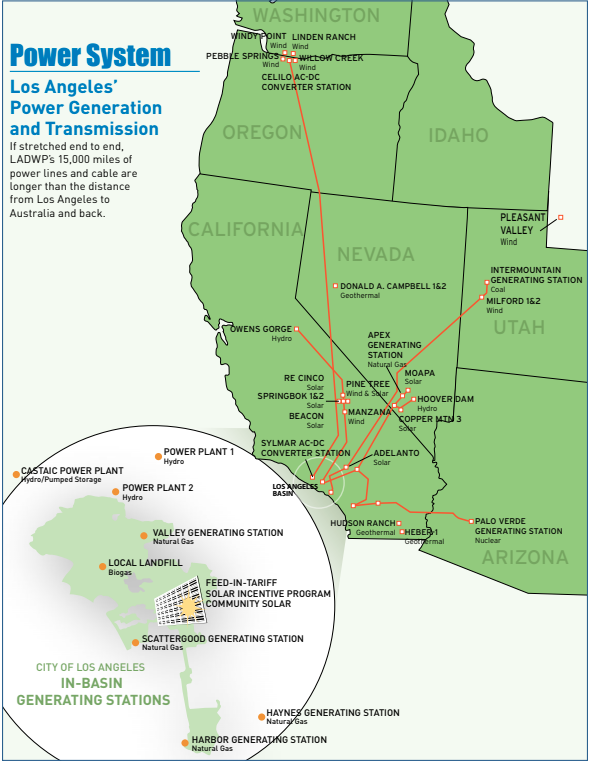 Every one of LA’s electricity-using structures connects to our gigantic, state-spanning, literally billion dollar power system. Your humble home is one end of a story spanning hundreds of miles and involving thousands of people. Here are the Whos, Whats, Wheres of that story. You’ll never flip a switch the same way again! The Los Angeles Department of Water and Power (LADWP) supplies all of the power LA uses every day. The LADWP is the nation’s largest municipal utility. 9400 employees help manage an electrical system capable of generating over 7,880 megawatts of power. These employees are responsible for inspecting, maintaining, repairing, and operating the entire system. The LADWP supplies power to 1.5 million customers in LA and over 5,000 customers in Owens Valley. Overall, the LADWP power system supplies an average of over 26 million megawatt-hours of electricity to LA every year. The LADWP was established in 1902 to deliver water to LA. In 1916, it also began distributing electricity. It costs roughly $4.1 billion to supply LA with power every year. Water and electrical service charges fiance all these operating costs with no additional tax support. The LADWP is managed by five-member Board of Water and Power Commissioners. These board members are selected by the mayor of LA and confirmed by City Council. If you live “on the grid” in Los Angeles, you have the LADWP to thank for your electricity. What Generates All That The Power? California is a national leader in implementing renewable energy production. As of October 7 2015, California signed Senate Bill 350, the Clean Energy and Pollution Reduction Act, into law. Senate Bill 350 aims to reduce California’s greenhouse gas emissions to 40% below what they were in 1990 by 2030. To meet this goal, every part of California–including LA–is quickly scaling up how much renewable energy it uses. The state hopes to get 33% of its electric power from renewable sources by 2020, and 50% by 2030. To help accomplish this goal, the LADWP is in the process of implementing the Power Strategic Long-Term Resource Plan (SLTRP). The SLTRP is a 20-year plan for aligning LA with Senate Bill 350 and LA’s 100% clean energy initiative. As part of this plan, LA will eliminate coal as a power source, decrease natural gas use, incorporate more renewable energy sources, and more. A detailed breakdown of the 2017 SLTRP is available online. Where Does That Power Come From? Overall, 15,000 miles of power lines and cables are required to transport and distribute LA’s power! Now you know who supplies your electricity and where that electricity comes from. But all that is only half the story! All of this generation and distribution happens long before your electricity reaches you–and often far away from you! Next week, we’ll cover how your electricity reaches your home and how you use it once it reaches you. All of this information on LA power is fascinating… but we’re guessing it’s not much help if you’re having an electrical problem right now. If you’re dealing with a frustrating or dangerous electrical problem, give Mike Diamond a call right away. Our experts can make sure everything’s working safely and effectively.